The truth is, with a well-designed cloud-editing system, you don't realize you're working in the cloud. You're just ... working. The system can be just as responsive and powerful as an on-premises one, but with all the benefits of the cloud - unlimited storage and computing power; automatic upgrades with no need for supercomputers or special hardware; compatibility across platforms; remote access for anyone you allow; and easy integration into existing workflows and services. You can view, comment, log, search, edit, publish, and archive your media just as you've always done, but do it more quickly and efficiently in the cloud. Cloud-based systems can make all the difference in broadcast post-production by serving as a complement to the standard NLE systems prevalent in these workflows. Forscene is used extensively to prepare for the craft edit - particularly on quick-turnaround projects, productions with a high-shoot-ratio, or when people need to give input from various locations. Forscene frees production teams up from linear processes - now shoot crews can use the cloud to share footage directly from location with team members anywhere in the world. This means that post-producers can influence the shoot while it's ongoing, loggers can start assigning metadata to the footage so that it can be searched easily, and story producers can start putting rough cuts together before the shoot even finishes! There are no specialised hardware or software requirements to use Forscene and users anywhere in the world can be given access to an account within minutes. No more couriering DVD's to clients for approval, no more booking edit suites for reviews. Forscene's integration with leading NLEs means that your sequences can be exported and auto-conformed against the high-resolution source in seconds - giving you a head start on your craft edit. Unlike in broadcast workflows, where the aim is to quickly and efficiently lay the groundwork for finishing in the edit suite, sport workflows have a different goal: Publish the content as quickly as possible. With Forscene, live feed proxy streams from multiple cameras are available to edit while they are uploading to the cloud. Editors can view and use the material they need for highlight clips or packages and publish directly from Forscene to their CDM. Forscene references the original high-resolution source when it publishes. A major advantage of using Forscene in sport workflows for Web distribution is that, instead of sending multiple editors to the events to get the data, you put the data in the cloud and leave the editors at home to work in their local offices - saving travel expenses, overtime, and the stress of being away from home for extended periods. When it comes to bandwidth and hardware, one might assume that cloud editing would require lots of bandwidth and a powerful (read "expensive") computer, especially when working with 4K, but that is not the case. 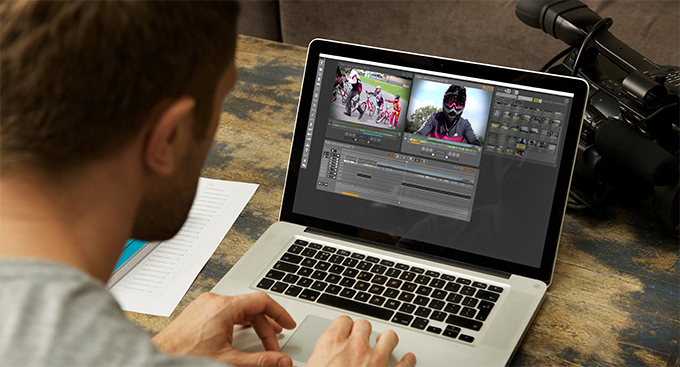 While it is possible to upload and edit in 4K in the cloud, it's generally unnecessary. For most of the process, standard definition is sufficient. In the same way that you would normally work with lower resolutions during an offline edit, the standard Forscene workflow is based on uploading proxy versions of your content into the cloud - enabling you to work on a standard computer over a normal Internet connection. In terms of security, the cloud is actually more secure than the average local device. With so many people working from home or in the field; on a myriad different computers, phones, and tablets; on different platforms; and on different networks, it can be difficult if not impossible for a media company to ensure every device and every file is protected all the time - a task that could distract media creators from the job at hand. In contrast, cloud suppliers are IT experts who are clued in to the latest security breaches and will attack them immediately as part of the cloud service - leaving the media companies free to concentrate on turning out creative content. Cloud systems are generally password-protected and backed up regularly, and with the right solution, the program resides only in RAM on the user's machine - project media isn't stored on the local device. Once the user logs off, the RAM is purged and saved edits are backed up automatically in the cloud. Tapping in to the right cloud platform for editing is rather like tapping in to the Hoover Dam for electricity: You get a mighty, reliable, secure source of power with economies of scale that let you operate more efficiently and at lower cost than generating your own electricity. Like plugging in a lamp, you just log in to the platform, and you're connected via the Internet to the massive power of the cloud. Which leads to the next point: When you have the right cloud-editing platform, you don't need IT expertise to make it work or hours (or days!) of training to understand it. You just need to know how to edit. For example, unlike other NLEs or other on-premises systems, which can require significant setup time to integrate into your existing workflow, Forscene was designed to be configured quickly and used immediately. Users will find the new interface intuitive and similar to that of other popular NLEs, with features that are powerful and responsive enough for savvy professional editors, yet simple enough for producers and directors. If there are questions, users can access training videos and live, interactive online support 24/7 directly from the interface. It might be tempting to stick with the status quo rather than making the move to cloud editing, but consider this: Shunning cloud editing in favor of a workstation is like shunning a car because you can walk wherever you need to go. Sure, you can walk, but driving is much faster. By the same token, you can keep editing on your desktop, but cloud editing will get the job done much more quickly and efficiently. Plus you get benefits that a hardware solution just can't provide: Immediate, all-hands access for better collaboration; enhanced security; infinite scalability without spending time and money on upgrades and system maintenance; and pay-as-you-go service rather than capital investment. With Forscene in particular, you get the freedom to work from any device anywhere over a standard Internet connection, with no need for a special machine or knowledge. And proxy upload and editing means you can sift through high volumes of content more quickly using less bandwidth and storage. All of those factors lead to less time being wasted in high end edit suites and more time being creative.